Type ‘performance anxiety’ (PA) into a search engine and oh my, you’ll get a tonne of links for the kind of PA that I’m not really talking about here if you get my drift! I mean in the world of voiceover of course and thought it might be helpful to share a few approaches I use to work through it in the hope that it may help others. Firstly I should say, I’ve found it’s not really talked about in the open that much. I get that! Like most things associated with anxiety we have a deep-rooted fear that people will judge us negatively. I’d suggest in this day and age however that that’s not usually the case. Quite the opposite in my experience actually. Which is why I’m happy to put it out there – I’ve managed PA for years! It’s SO common in the creative industry that it’s surprising really that people aren’t more open about it. I’ve no doubt however that you’ll all be able to name some of the biggest and best performers ever known that have confessed to pre-performance nerves. Of course it’s important to note that people experience it to different degrees but the first step to overcoming it is the same for everyone and that is to officially join the club so to speak! One of the best things I ever did many moons ago was to accept it for what it is. Regardless of how much I improved in my work (in my previous work I mean here) I still suffered that pang of anxiety before a group presentation, before addressing a conference or training session. And similarly over the more recent years in my VO work I feel the nerves before a directed recording session or perhaps even some coaching. It’s always there regardless. The difference nowadays is that I accept it, I know what to expect, what works for me to minimise it and even how to use it to my advantage. It’s possible – it really is, just hear me out. For me it presents itself immediately before the event, not days before like some people thankfully, so I never lose sleep over it. I get the classic pit in the stomach, that unsettled feeling like it’s all going to go drastically wrong. 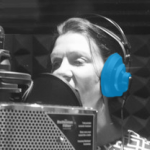 My breathing isn’t at it’s best and the classic dry mouth rears it’s ugly head – the worst symptoms really for pulling your best VO performance out of the bag! But it’s all good because these are familiar to me now. So I don’t resist it, I run with it….because I’ve got everything in place to ensure, as always, that it will all not just be ‘fine’ but will be great and even enjoyable! So being prepared for a session is key. My anxiety isn’t about my performance usually….it’s more about making sure I’ve recorded it OK for the client. That there’s nothing technically at fault at my end. So I minimise that anxiety by being prepared well in advance – I check everything’s as it should be. If there’s a possible contingency/Plan B needed I have that lined up too! I have my scripts on my ipad for example but I’m good to go should I need to quickly print one off if there’s a technical hitch during a session. Warming your voice up prior to a session is always a good idea regardless but for me a warm up helps release muscle tension too. I warm up with the delightful Eric Arcineaux (look him up if you’ve not heard of him – he’s awesome). So I enter a session physically relaxed and vocally ready to rumble. This in turn settles my breathing. For my dry mouth I’ve found that chewing gum works a treat. I get rid of it of course just as someone is dialling in! Once the session gets going I find it doesn’t persist anyway. And just before I start the session, I’ve learned not to focus on what could go wrong (because I’m prepared for all eventualities right?) but to focus on the job in hand; to smile, use the adrenaline to my advantage, to trust my training and experience and remind myself that 99% of the times it’s great fun and I deliver what’s needed for my client. So, if you’re a fellow sufferer that’s not quite cracked your PA paralysis I hope that my ramblings have perhaps given you some food for thought or at least made it known that you’re not alone. Or if you too have some top PA tips that could help someone else in the VO community – please do tell! I am delighted to be a member of the World-Voices (WoVO), a non-profit, member-driven international association of voice actors. WoVO works to inform and educate about best practices, standards for ethical conduct and professional expertise.